I’ve never been one for breakfast. My stomach doesn’t really wake up until mid-morning. Sure, I try to take the time to make a hot breakfast for my little boy before he heads off to school, whether that’s fried eggs and fresh tomatoes, or homemade oatmeal. For the most part, I sip something first thing in the morning: jasmine tea, bone broth sprinkled with salt and garlic, and lately, I’ve enjoyed spiced butter tea – rich and milky and spiked with warming notes of black pepper, cloves, cinnamon, cardamom and ginger. Later, especially on the weekends, I might make something special for brunch: oat and berry cobbler, sourdough pancakes. But, for the most part, first thing in the morning I want something very light, but also very nourishing: and that’s when I landed on spiced butter tea which reminds me of a homemade chai latté, only fortified by good fats and protein. Traditional butter tea usually begins by simmering compressed pu-erh tea, a dark fermented tea with a smoky mushroomy bloom of flavor, in water for several hours. This concentrated tea is then strained. Then, tea makers draw off just what they need and churn it with yak butter and, occasionally, yak milk as well as sea salt. This forms a strong, milky, frothy bitter tea which was the inspiration for the monumentally popular Bullet Proof Coffee that’s trending right now. Butter tea is a traditional food from Tibet where the caloric and micronutrient value of yak butter provided much-need sustenance against rugged terrain, bitter cold weather and a lifestyle marked by the physical hardship of mountain living. Natives to the area would drink cups and cups of the bitter, milky tea throughout the day for sustenance. For my part, I take inspiration from tradition and then adjust it, ever so slightly, with the inclusion of additional ingredients: spices for flavor and warmth; grass-fed ghee, MCT oil and milk instead of yak butter, collagen for a boost of protein, and jaggery for a touch of sweetness. In the end, mine resembles a chai latté, though slightly more bitter and definitively less sweet. As someone who has always struggled to eat (much less enjoy) breakfast first thing in the morning, I tend to rely more heavily on bone broth sprinkled with salt and garlic in the morning, or this spiced butter tea – particularly during the cold months of winter. I make the strong tea first, storing it in the fridge and only taking out a cup or two when I need it. And, then, I finish the tea: adding in the ghee, salt, milk and jaggery. I churn it with a milk frother (like this) until it turns wonderfully frothy. Where many other teas like oolong and black tea achieve their color and flavor through differing levels of oxidation, pu-erh achieves its through both oxidation and true fermentation, making it relatively unique. Legend holds that pu-erh was discovered, and the fermentation process of the tea mastered, by accident – much like cheddar cheese or bog butter – in that tea was cached by travelers, and it aged inits hiding spot before rediscovery. Eventually, people began to age tea specifically for its dark, complex flavor with vague notes of smoke and mushrooms. Pu-erh has always been one of my favorite teas to brew. I like its depth, and its richness. I typically by my pu-erh tea here where I buy my herbs and spices, but you can also find it in specialty shops and natural grocers. I love the heady aroma of sweet spices found in classic chai masala: ginger, black pepper, clove, cardamom, fennel. For me they’re at once stimulating and comforting. Particularly during the depth of winter, the warming notes of spices like cinnamon, clove, black pepper and ginger can brighten otherwise cold and dark mornings. 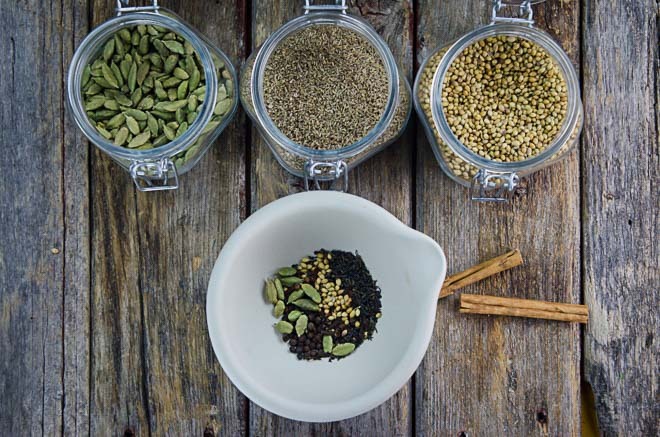 I use a fair number of spices in my kitchen, not only for spiced butter tea, but also for dishes like curried lentil soup or sweets like apple pies or election cake, so I buy organic and fair trade spices in bulk here. When they arrive, a pour them into glass jars and tuck them into the cupboard, either using them whole or grinding them fresh in a my spice grinder before I toss them into a pot. In traditional Tibetan butter tea, yak butter and, from time to time, cream or milk would be swished into the concentrated tea and then churned together which made the tea particularly frothy – emulsifying the butter into the concentrated tea. While yak meat is relatively accessible where I live, yak butter is, as you might imagine, not. Grass-fed butter (and ghee and cream and milk) is particularly rich in conjugated linoleic acid, a healthy fat that you can read more about here. It is also a rich source of true vitamin A as well as vitamin K2, which plays a role in bone, heart and reproductive health. Recently, and this is far from traditional, I’ve stirred a scoop of collagen peptides into my morning butter tea as a way to boost its nutrition by providing me with a bit of protein in the morning. I’m rarely one to eat breakfast, favoring, instead, tea or broth first thing in the morning at around 7 and then a very light brunch around 10 AM. I’ve been using collagen peptides and gelatin from grass-fed beef cows (find it here). Collagen and gelatin are pretty heavily processed and are straight protein, so while buying gelatin made from grass-fed beef over regular gelatin won’t convey any distinct nutritional benefits, it does support a system based on animal welfare. That is valuable to me. Sea salt is a traditional addition to Tibetan butter tea, and jaggery is not. Both unrefined sea salt (I buy this kind) and jaggery (find it here), a type of unrefined cane sugar, contain trace minerals. Jaggery, as an unrefined sugar, offers a sweetness tempered by bitter and dark notes from its residual molasses. For that reason, the jaggery stands up well to the dark pu-erh tea and the simmered spices. 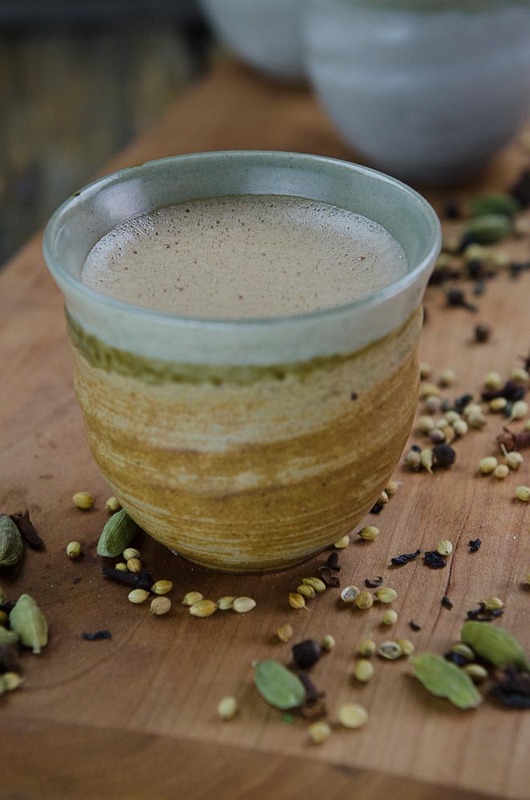 Faintly sweet and bitter, this spiced butter tea combines the rich warmth of cardamom, ginger, fennel, black pepper, anise and other spices with ghee, milk, jaggery for a warming, creamy morning tea. The addition of collagen or gelatin provides a boost of protein. You can buy the pu-erh tea and organic spices called for through our affiliate partnership with Mountain Rose Herbs, or at your local natural foods store or spice shop. Bring water to a boil over high heat, and drop in the tea and spices. Immediately reduce the heat to medium, and simmer for 10 minutes. Remove from the heat, and strain the tea. You can serve the tea immediately, or pour it into a jar and keep it in the fridge for up to one week. To prepare a cup of the tea, heat one cup of the prepared tea in a saucepan over medium-high heat until very hot. Stir in the jaggery and salt, until completely dissolved. Stir in the ghee and the milk. Turn off the heat and blend until frothy with a hand-held milk frother (like this one). Pour into a teacup and serve hot. Posts on Nourished Kitchen contain affiliate links and links to sponsors. I’m fascinated by this butter tea as well. In particular, I like the anise seeds, and anise pods. Wow. I love that flavor. I am not able to eat dairy including ghee. What substitutions would you suggest? I also don’t have jaggery so I used coconut sugar. It was a little sweet, so next time I think I will add 1/2 T instead of whole. I think the kefir might give it a strange curdled texture. You could try and let us know, though. This looks great! I don’t do well with caffeine, have you tried any herbal teas in this recipe? Perhaps Rooibos? I think rooibos would work nicely. I was wondering if you just deposit the collagen (or grass-fed gelatin in my case) into the prepared tea? Or do you dissolve it in liquid first? Will replace all dairy with coconut/ghee most likely and sub puerh for homemade chai masala tea! This recipe calls for collagen peptides (not gelatin), and they dissolve into liquids (hot or cold) without clumping. This looks great! I’ve been enjoying some herbal chai tea blends because I don’t drink caffeine, but I love the spicy drink mixed with milk. Does the pu-erh tea have caffeine in it? Yes, it is on-par with black tea. Same plant, just different process. Thank you! You are just amazing at how you continually come up with new and such informative recipes. I also love how you include such history in your post. I am trying this soon. Again, thank you. I can not imagine how much work you put into this blog. I appreciate having such a valuable and FREE resource! Thank you, Emma! I really enjoy cooking for myself and my family, and it’s exciting to share the good recipes with readers who can appreciate them. There’s plenty of failures along the way, too. Thank-you for the recipe Jenny. It looks wonderful. I was wondering does pu-erh tea have caffeine in it? Thanks a bunch. Yep! It sure does. I think you could probably make this with rooibos as a substitute. I wanna pass out this looks so good. I just bought some Pu-erh from Bellocq – they have the best blends! Anyway, I am doing the Whole 30 and wondering if it would be good if I made it like I do Bulletproof coffee – after all, it would be similar to the original although I have no yak butter in my frig at the moment. If it’s not too cold in the morning, I’ll head for the hills and get my churn out… Have you tried it with coconut oil and grass-fed butter and subbing the Pu-erh for coffee? THANKS, Jenny! I love your mug! Is it handmade?? Hi Jenny – I’m continually fascinated at the amazing and interesting traditional recipes you come up with. How do you find the time with a little one?! Just a quick question – is there any reason you can’t use normal butter instead of yaks butter? Yak butter is just what the Tibetans use. So in local North America you would go looking for a Pastured Butter. Failing that any good quality organic butter should do the trick. Think cows that eat grass rather than grains such as corn etc which remove all the omega threes from their milk making it of much lower quality and lower value to the human digestive system. Since you posted this recipe, I’ve tried it with Pu-erh (from a tea bag), Assam, and Rooibos – all were delicious! This is my new favorite tea ritual! Those 3 teas were just things I had in my cabinet, but I’m looking forward to getting some loose leaf Pu-erh and following your recipe more to the letter. Just discovered your blog a few weeks ago and I am LOVING it. 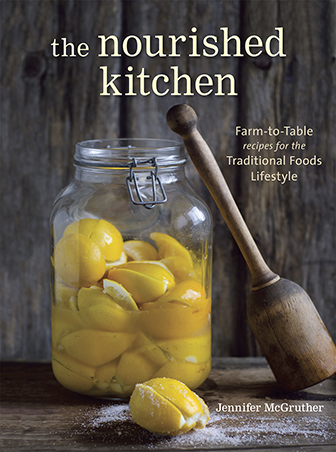 Your cookbook arrived yesterday – it’s wonderful! Thanks for much for doing what you do! I’m feeling very inspired : ). Firstly, I love The Nourished Kitchen. Been following for about six months now, but I have never commented. So, today we’re about to change that! I am familiar with Bulletproof Coffee (am drinking some right this very moment!) but I don’t know what “fermented tea” is. Can you please elaborate a bit further? Was waiting on this: have been skeptical of “biohacker” (worst nutritional term, ever) claims re: bulletproof coffee, but was super intrigued by idea of butter tea. Giving this a try tomorrow morning, merci! I use essential oils… the kind that you can injest. Do you know the amount of drops that you would use? For fennel? Cinnamon? Coriander? Clove? Etc.? Hi. I have a similar question to the unanswered one about fermented tea. Is the Pu-erh already fermented, then dried? And how does one pronounce Pu-erh? Some pu’er brick tea has been found to contain very high levels of fluorine, because it is generally made from lesser quality older tea leaves and stems, which accumulate fluorine. Its consumption has led to fluorosis (a form of fluoride poisoning that affects the bones and teeth) in areas of high brick tea consumption, such as Tibet. Sadly, this is a definite concern with some teas…especially from older, larger plants. I bet the mix would be nice to make like butter tea – will have to give it a try! Thank you Jenny for some great ideas! Actually they use himalaya salt. Just had an authentic Tibetan tea yesterday. Himalayan salt is a type of sea salt. It comes from ancient beds. At any rate, if you’re looking for an authentic recipe, this is not it. Thank you very much and happy 2015! Hi Jenny. After reading your post last week w/ this recipe, knew I had to try it.. Promptly checked my spice cabinet to see what I already had on hand, bought missing ingredients locally where possible, and ordered the collagen peptides, jaggery & coffee++ online. With all ingredients finally in place, I made the tea mixture yesterday & put in fridge; just downed my first-ever cup of butter tea, and WOW! Delicious! Like you, I’m not a morning person, so this is a wonderful way to start the day. Might try the next batch using rooibos, or make a separate batch, so I can enjoy it as a mid-afternoon treat w/o having to worry about the caffeine keeping me up at night 🙂 Many thanks for the healthy inspiration! Isn’t it just crazy good? I think rooibos would be a good choice for the afternoon, too. This sounds really good however the coffee++ is made with Palm oil… Have you done any research on how BAD palm oil is on our environment?? After looking high and low locally (60 mile radius) for Pu-erh tea to try this compelling recipe, I finally located some Numi “Emperor’s Pu-erh” tea bags. I wanted to try it at least once before ordering a large bag of the bulk tea online. Today, finally, I assiduously assembled the ingredients and made the recipe. I poured the hot spiced tea into a cup, stirred in the jaggery, salt, ghee, and raw jersey cream (instead of milk), and—oh—swoon…I nearly fainted with ecstacy! The combination of un-earthly earthiness from the Pu-erh, the mellow sweetness of the jaggery, and the golden butteryness of the (homemade) ghee, as well as the cream-y goodness was the perfect chant of flavors for a grey winter day. I wouldn’t substitute a thing in this recipe, Jenny, it is outstanding. Spiced Butter Tea will be gracing my mornings for the days ahead, and I’d better get that bulk tea ordered. Thank you so much for the inspiration, the history, and the recipe! I had to buy all the spices except for the ginger, so I was really hoping this would be worth the cost, and it was! I will say that I first tried it with coconut oil and no milk, and somehow that made the tea bitter tasting. I then tried it without the coconut oil and it was SO delicious. Weird thing is that I normally cannot stand anything anise-tasting, but I love this tea. Thank you for this recipe. It makes me excited to wake up in the morning (I’m serious). Anyway, just wanted to tell you that this is truly amazing. I can’t wait for my husband to wake up and try it! Skye, I’m not sure what kind of ginger Jenny used but I have a freeze dried pieces of ginger that I bought in a normal food store (Star market or Shaws I think). It’s in a glass bottle and you can also buy garlic the same way. I use that for infusions and tea and as an ingredient (pulverise it with my hands if needed) and that worked for me. Can you be a big help and suggest a modified recipe (other than leaving out the possible offenders) for us struggling on AIP without seed/fruit spices? No, I can’t. Seed and fruit spices are integral to Chai masala, so if you omitted them or substituted for them, you would completely change the flavor. If you have AIP needs, best to reach out to an AIP expert, as they might have better suggestions. Jenny, I’ve been enjoying your blog and recipes for a couple years now — thank you for all of the amazing info you provide! I just wanted to add in a few bits about butter tea, as I spent some time in my 20s trekking and living in Nepal, Tibet and Ladakh (a northern province of India with people ethnically and linguistically related to Tibetans) — and during that time, drinking lots of butter tea! Not only does it provide all the benefits you listed, it works as a terrific lip balm, since rancid yak butter is very thick and sticky (lol)! We often mixed tsampa (roasted barley flour) into the tea, to make the tea into a nourishing meal/soup. I traded for some yak yogurt at one point, from a family pasturing their yaks in the mountains we trekked through, that I kept in a glass mason jar with a metal lid/ring. The yogurt culture was so active it could push the top off! I could literally hear it growing at night, in my tent! This sounds great, and I will surely try some. Anyhow, I want to point out what must surely be a typo, and please excuse me for laughing about it. In your second paragraph, you mention “chair latte”. If this is a real thing, please disregard the correction, and write a new story explaining what chair latte is. Where can I purchase that cup? I need it to go with this fabulous tea! Isn’t it gorgeous, Char? I bought it at World Market. Jenny: This is a great read. Hmmm, I need an easier method, so how about you package up the basics and sell to us, eh? I would be happy to buy some. That article is written by people who sell coconut oil for a living. It’s a marketing piece. I totally agree here and would only ever use coconut oil ON my skin not my food! Its all marketing bxxxshit! I am excited about making this tea but am confused about the prep, do you grind the spices first? It doesn’t make that clear, you mentioned earlier that you sometimes use them whole so I was just wondering…..
Generally, if the recipe requires the spices to be ground, I would include that in the instructions or called for ground spices. In this recipe they’re used whole which is why I’ve called for whole spices. So many things in this post that I’ve never heard of before! Butter tea! Collagen peptides! Jaggery! What an adventure. I’d like to try it first for the flavor, before I buy the expensive collagen and creamer. Would coconut sugar be a good substitute for jaggery? Or sucanat? I also have a very hard time eating breakfast in the morning. Nothing is appetizing, yet I’m always starving once I wake up- so much to the point I sometimes feel sick. I always have a cup of green tea, and either an apple with peanut butter or toast with peanut butter. Then I’ll eat leftovers or make something breakfasty around 10:00. Does the butter and collagen help ‘fill you up’? 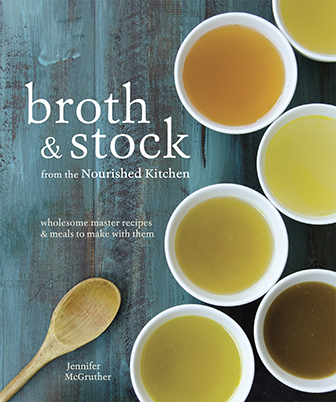 I also love the idea of drinking broth. Yes, the ghee and the collagen provide a little bit of nutrition in the way of protein and fat to take the edge off. Thank you for the descriptions on everything you added into this butter tea. I’m new to butter tea and have been having it every morning and can’t live without it now. Just love it, thank you for the recipe. Does Pu-erh have caffeine? If so can you read a caffeine-free alternative? I think my 13 year old could stomach this in the morning- he is not a breakfast person. All tea (camellia sinensis) has caffeine, including puerh. You might try using rooibos, though which is not tea and doesn’t have caffeine. This sounds the business. I’d love to give it a go – but could it be made successfully with other than puerh tea? I’m sure you could use another tea. Rooibos would be nice, and it doesn’t contain caffeine. I have a question, to make the tea traditional way Tibetan people would boil it for hours, as you mentioned above. Do you have any idea how long the concentrate could be stored for? I only imagine it is best done in the kitchen when the fire in the stove is constantly on… Otherwise, it would be quite expensive. You can store it for a week. This is seriously the BEST chai I’ve had since traveling in Tanzania. The chai the Maasai women made in the bomas had a completely different taste, but the spicy comforting warmth is the same! I have tried out several different chai recipes over the years, but only this one comes close. Should it only be drunk in the morning? In place of breakfast? Or with? Thanks! This week I am “eating”your website recipes for my meal plan. Can’t wait!